With Google experiencing plenty of competition on all fronts including competition from Bing, Yahoo and Facebook, Google is looking to innovate their search product offering giving users the very best experience possible. While almost all will agree competition is great, the speed at which Google is offering new products, rolling out new features and changing some of the core ways it searches the web can be headache-inducing for those in the SEO and SEM industry. The latest offer by Google is its Instant Previews. What is Instant Previews? Plain & Simple, now when you search for akeyword you will receive your normal results with the addition of a magnifying icon besides each listing. Clicking on the magnifying icon will quickly show the page as an image to the right. 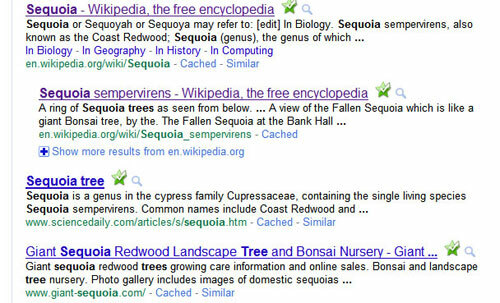 Below, I conducted asearch for the keyword: Sequoia tree. Below is a cut-out of the samplelistings. Googlehopes to make the search experience more efficient and fun for the user. One of the many issues users experience is clicking on links thatdon't deliver the information one is looking for. In the past Google has done a phenomenal job at reading people's minds and delivering highly relevant webpages tailored to a person's search. However, with the addition of this feature, Google hopes to make the search experienceeven more accurate. IfI was interested in seeing pictures of actual trees, this choice would have been unsatisfactory, however utilizing the Instant Previews feature, I can search through Google's listing visually finding the listing that fits my search the best. While Google's Instant Previews isn't a game-changer it can become a popular feature. For those of us in the SEO & SEM industry it does have obvious implications. First, as always you want to make sure your entire website (not just your homepage) is attractive and visually appealing while also efficient at conveying information about your products & services. You also might want to think about adding images and other media to all of your webpages. Plain text obviously is not as appealing as a page that has both text and images in an attractive layout. In addition, to just adding images to each webpage, you might want to pay close attention to the top section of the page as this area might get the most attention from viewers both using Google's Instant Preview and physically visiting your site. One disadvantage that I do see regarding this feature for us in the industry is that there looks to be no way to measure how many people previewed a page of ours. This information can be highly useful in tweaking a page, making it more attractive or appealing to users. As always, I will keep you posted if any new information comes out on what I think is a highly useful feature.